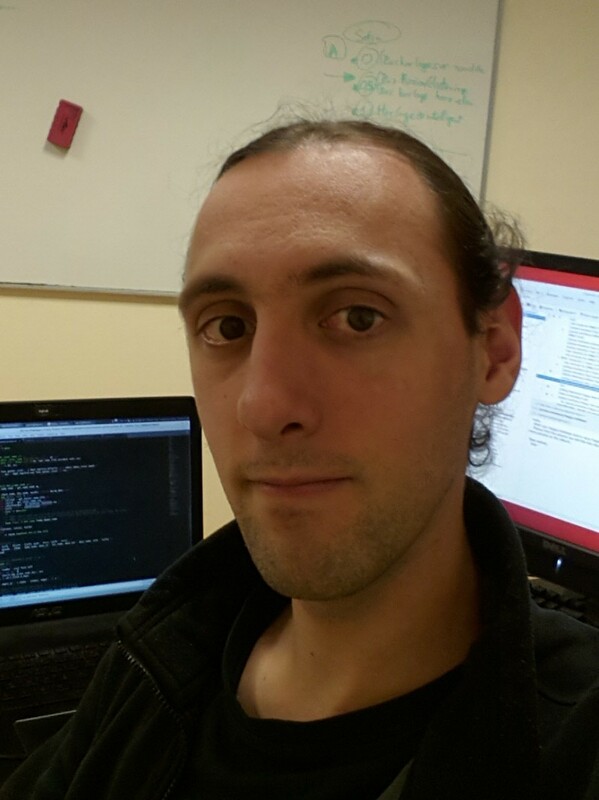 I am currently finishing a Post-Doctorate at ENS (team Parkas), working on synchronous language and the Heptagon compiler, in the context of the european project Assume. My main research topics of interest are the polyhedral model, program equivalence (in particular using semantics properties) and synchronous languages. Post-doctorate: My current post-doctorate is about synchronous language, in the context of the project Assume. The goal is to map industrial applications into the Kalray MPPA. I am mainly working on the front-end aspect, by exploiting the harmonic multirate aspects of the periodic clocks of the applications. I am working with the Heptagon compiler for this project, and in collaboration with Airbus and Safran. I am also working on a OpenCL backend to the Heptagon compiler (project Redefine), in order to offload computations on an accelerator. PhD: "Detection of linear algebra operations in polyhedral programs" (Dissertation / Slides of the defense). My PhD was a cotutelle between ENS Lyon (advisers: Christophe Alias, Alain Darte/ team: Compsys) and Colorado State University (adviser: Sanjay Rajopadhye / team: Melange). This work contains mainly two contributions: the monoparametric tiling (also called Constant Aspect Ratio Tiling), a parametric tiling in the polyhedral model, and a template recognition algorithm, which can manage semantic properties commonly encountered in linear algebra (in particular the associativity and commutativity properties of reduction operators). These contributions were combined in order to recognize automatically tiles of the program as combination of BLAS library calls. Guillaume Iooss, Christophe Alias, and Sanjay Rajopadhye. On program equivalence with reductions. In 21st International Static Analysis Symposium (SAS'14), Munich, Germany, September 2014. Lucas W. Krakow, Louis Rabiet, Yun Zou, Guillaume Iooss, Edwin K. P. Chong, and Sanjay Rajopadhye. Optimizing dynamic resource allocation. In Proceedings of the International Conference on Computational Science, ICCS 2014, Cairns, Queensland, Australia, 10-12 June, 2014, pages 1277--1288, May 2014. Yun Zou, Guillaume Iooss, and Sanjay Rajopadhye. Compilation of structured polyhedral equations. In 17th Workshop on Compilers for Parallel Computing (CPC'13), July 2013. Guillame Iooss, Sanjay Rajopadhye, and Christophe Alias. Semantic tiling. In Workshop on Leveraging Abstractions and Semantics in High-performance Computing (LASH-C), Shenzhen, China, February 2013. Guillaume Iooss and Sanjay Rajopadhye. A library to manipulate Z-polyhedra in image representation. In 2nd International Workshop on Polyhedral Compilation Techniques (IMPACT'12), Paris, France, January 2012. Keryan Didier, Dumitru Potop-Butucaru, Guillaume Iooss, Albert Cohen, Jean Souyris, Philippe Baufreton, Amaury Graillat. Parallelisation efficace de larges applications temps-reel. Research Report, RR-RR-9180, INRIA, 2018. Guillaume Iooss, Sanjay Rajopadhye, Christophe Alias, Yun Zou. Mono-parametric Tiling is a Polyhedral Transformation. Research Report, RR-8802, INRIA, 2015. Sanjay Rajopadhye, Guillaume Iooss, Tomofumi Yuki, and Dan Connors. The stencil processing unit: GPGPU done right. Technical report, Colorado State University, March 2013. Tomofumi Yuki, Vamshi Basupalli, Gautam Gupta, Guillaume Iooss, DaeGon Kim, Tanveer Pathan, Pradeep Srinivasa, Yun Zou, and Sanjay Rajopadhye. AlphaZ: A system for analysis, transformation, and code generation in the polyhedral equational model. Technical report, Colorado State University, May 2012.